Good morning Israel, the countries keep racking up. The morning got off to a rip roaring start at 06:00. We met in the breakfast room at 06:15 and when Frank appeared it was noticed that the backside had just been torn out of his trousers. This dramatically reduced the calorific intake at breakfast time as our attention was drawn to the possibility that we could all fall victim to the same fete. We shortly after set off on our drive to Jerusalem. First impression is of a green land which is expensively irrigated. The Jewish parts are well maintained and much more affluent the Arab neighbourhoods were barren looking and poor. Through tel Aviv and we ascend to the city of Jerusalem. Here the guide artfully described the many and various scenes available to us, far too many to mention here. Briefly we went to the garden of gathesemene (sic) the place Jesus spoke to his father before he was arrested by the Jews and Romans. We then went into the walled city where we saw the wailing wall and also traced the steps of the journey with the cross to galgatha (sic) where Jesus was crucified and laid to rest. All this area is no longer a hill or garden but inside a large church of the sceptre. This is a most powerful place to visit there is so much happening here, both historic and also political. The Arabs and Jews are clearly still intolerant of each other and it is very evident in Jerusalem. To have any chance of seeing all that is to offer here it would take a week. Another point is that considering the holy importance of this small city to Christians, muslims and Jews it is run like a car boot sale. There is no crown management it is just a free for all with jostling and shoving going on all the time not very holy behaviour. After lunch we set off for Bethlehem. It's only about 4 miles away, and it's fair to say that it's nothing to look at. A large ugly town has grown around a most magnificent nativity square and the church of the nativity. You enter the church from the lowered door believed to have been named after the eye of the needle referred to by Jesus. Inside is a big church which is in poor repair as three faiths own it orthodox Christians almanian Christians and catholics. They all say mass there twice a day. But can't agree on how repairs should be carried out so now the roof has been leaking for three years. 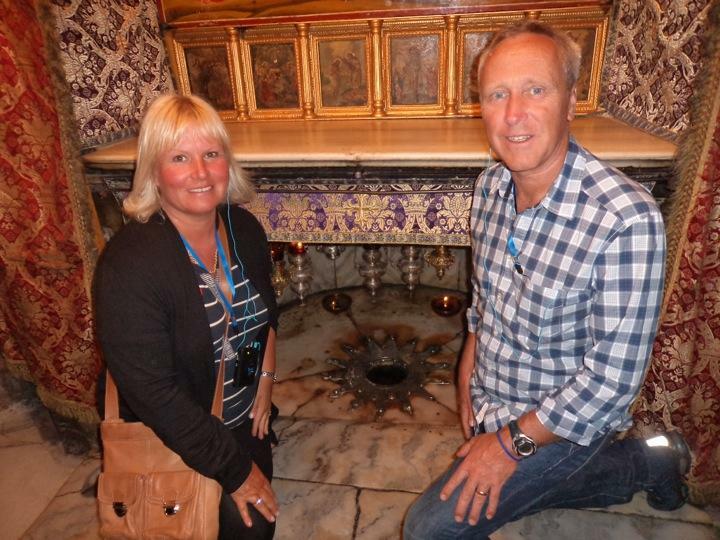 Inside you find the manger and spot Christ was born and when you visit it it is truly a moving time. Loads more I could say but it has been a fantastic day really interesting To any Christian I would think and you don't have to be a holy joe to enjoy it. Lastly can I congratulate Pete on his retirement, can't wait to catch up on all the developments but guarding that it all went positive with your employers. Well done mate! Valda & Michael Hi Eamonn & Wendy, We are really enjoying all your blogs, just wish we were still there with you and the crew.